Death Parade spawned from the short film Death Billiards, which was part of the Young Animator Training Project's Anime Mirai 2013. Unlike death, Death Parade is no ordinary show. It’s rather extraordinary with an emphasis on the concept of death and expanding it into a game style format. But it’s more than also just simply playing a game because we see the ins and outs of what the players/characters are like. To put it figuratively, it’s more like playing life and death itself. The way the show operates is different than the usual survival game. This is because the characters are already dead. So what does Death Parade offer in its own little world? The show is produced by Madhouse that runs for 1-cour. But more interestingly, the series is actually an expanded version of “Death Billiards”, a half hour short that was apparently successful enough to spawn this full television show. And to be honest, I am quite glad it did. As the series is built on the very essence of death, there’s also an understanding the show brings in about it. Every episode revolves around something that our characters experienced in their past life that somehow led them there. For what’s worth, Death Parade unfolds as a series about lessons – to really let the characters know why they are there. The games (determined differently every episode) reveals the secrets of the participants and also decide their ultimate fate. It’s quite thought provoking since the series capitalizes on these ideas and really deliver its potentials. The games’ winner or loser isn’t really what’s important as it focuses down on the morality of the participants’ values. Decim, the bartender of Quindecim Bar, serves as an overseer of these games. With his trademark silver hair and a suit to match his style, each game literally becomes a thriller. Because of the style of the show, the story is neither divided into arcs or a linear story. Rather, it builds on themes and expands them with the characters involved. Themes included in the show has a wide variety that includes revenge, jealousy, suicide, hatred, isolation, justice, and other mature content. Even murder becomes a topic that is focused in a very intense two-episode continuation. The fact that Death Parade operates with these themes shows how deadly the show can be. And when it does with those themes really brings out the best out of our main characters. As such, don’t expect many of the supporting characters (or rather players) to return in the show. Their fate are determined at the end of each game. Some will leave no doubtfully very strong impressions and perhaps even gives you a moment of “wow, that’s what I used to be like or want to be”. However, others may bring disgust by the actions they’ve committed during their time when they were breathing on Earth. The endgame here is that every player is different whether they are an ordinary businessman, a member of a popular band, a pair of stereotypical couples, or even an elderly woman. Luckily enough, the show does have its own cast of prominent characters. I already mentioned Decim and he can be as humorous as he can be intimidating. The show makes a sort of statement that he is emotionless although his action sometimes contrasts this. Nonetheless, this individual will no doubt be a fascinating character for viewers to get to know better especially with the interactions he has with the players. Then, there’s Onna (she actually has a real name that is revealed later in the show), who serves as the assistant of Decim. Unlike some of the others, her personality seems normal. This is because she once used to be a normal girl before meeting her own fate. One specific episode actually concentrates on her including a revelation of Onna’s true name and backgrounds. As a show that heavily focuses on characters, it’s unsurprising that she gets her own spotlight after being on the sidelines. The remainder of the cast also play roles although not as prominent as Decim. These include Nona (Decim’s superior), Ginti (another bartender), Clavis, Quin, Castra, and Oculus. All of these characters have certain roles with some getting less emphasis than others. I do express concern regarding some of their presence including Mayu who serves more as a comical relief if more than anything else. But that might also not be a bad thing. It creates a balance of the show. With such a dark and moody atmosphere almost every episode, she can bring in a lot of fun. Indeed, the show actually has its comedy to balance out the series. What’s good to know is that it never fully derides from the series’ premise. What I mean is that the show never really loses its weightless suspense even when comedy is added into some episodes. After all, a mixture of entertainment and engaging story is important. Thankfully, Death Parade accomplished just that. Furthermore, the show uses these characters to build on the mechanics of the series from behind the scenes. Ever wanted what those creepy dolls are for? Or how the judgement system really works? The lifestyles of the arbiters when they aren’t monitoring the games? The show takes breathers to accomplish that aspect too. One other aspect of the show I find interesting is the relationships. I don’t just mean the main characters because there’s definitely chemistry between some of them. But rather, I’m referring to the players. The players’ chemistry during each game is phenomenal. Almost every one of them starts out as sort of normal. There’s a nerve wrecking mood as each game goes on that builds itself until its big climax. (with the whole organs and lives at stake) Sometimes, even Decim has to step in to stop situations that gets out of hand. This is because the games reveal the darkest secrets of the players as they open their eyes to the truth. And sometimes, that’s really heading into the mind-breaking territory. This is where Death Parade takes advantage of revelations to determine the fate of the players. It doesn’t always end perfect but it provides an enthralling experience for the audience. In essence, the show knows how to hook the audience into believing the story; regardless how ambiguous it may be at times. It’s something of a story that you have to watch and believe what you see to really get a tasteful experience out of it. Death Parade shares that experience with emotions, humor, and a thriller like a human drama. Thank you Madhouse. I express gratitude for Death Parade’s artwork and visuals as it has a great way to convey the moody drama. Although bars are often used as a place of leisure, the series’ games are far from fun. Each game has a different style and although they mirror real life games (Twister, Darts, Pool, etc), the added twist of the organs and pain carves a terrifying experience. Now, not every game has the sort of intensity as you would expect but what’s important is how the art makes it feel so compelling as if it’s almost real. The players themselves knows this as they realize what they experience. The expressions they show is also well directed to show human emotions. It’s interesting really. Almost none of the other main characters are human (although they have some humanoid features when disregarding their supernatural eyes) at all but even they show these type of emotions. Decim, the emotionless guy, even has a fascinating sense of human-like behavior on some episodes. Nonetheless, the majority of the series takes place at Quindecim bar. It’s like another pocket dimension of sorts that looks ordinary but far from normal. It’s like one of those mythic purgatory things you see out of the book where you have to believe it to be there. The artwork clearly gives an impression of that thriller-like feeling. Soundtrack is solid for the majority of the parts. The OST is thrilling to express the intensity of the games while solemn tones delivers the intention of its melancholic mood. But what’s most surprising is the OP song. When I first heard it, I thought to myself “is this really the opening song?” To my delight it is. It’s more like a false advertisement (compared to the previews anyways). Rather, the OP song brings a much lighthearted comedy aspect with the dancing, stylistic music, and cherry mood. Otherwise, we get the darkening and mood ED song to go along with each episode; although some has different footage depending on the players/games played. Finally, character voice mannerism matters a lot in this show. I give praise especially to Decim as someone who can make others believe he seems like an ordinary bartender but far from the Average Joe. So why should you watch Death Parade? Well, it’s like a gift that delivers game scenarios in a different perspective. It gives back a feeling of emotional appeal, terror, and beauty all the same time with the style of the show. Whether you feel like the episodes are more like imaginations or real, they always sends a meaningful message with its revelations. Even the comedy that goes behind the scenes and on-screen is entertaining with the clever timings. One thing I do regret is that the show is a 1-cour with less emphasis on certain characters as compared to others. But still, Death Parade is a really a rare breed. It’s a humanly compelling blockbuster that lives up to hype. YES... WE GET IT... THE OPENING IS NICE... Now let's talk about the show. If there was ever an undeniable truth it will be that death is inevitable. And it shouldn't be a surprise that a great deal of shows, in one way or another, touch upon that subject. But very few anime titles take the route of having the entirety of their content centered around it. As few as those numbers may be it's still been done before, but what Death Parade does differently is not the subject of the afterlife itself, but rather the judgement of the people that enter it. It's a show where the victims' morality is tested and pushed to extremes in order to achieve a verdict. With this final verdict being either reincarnation or being cast into the void (something like a permanent purgatory) . The setup itself is contradictory to the traditional sense of judging, since normally the one that gives the final verdict, in this case the arbitrator, remains impartial to the conflict. But with a setup that directly involves manipulating the emotional response of the afterlife victims, this is where the heart of the conflict takes rise. Now as good as that sounds on paper, a good premise doesn't equate to a good show. It all comes down to how it's executed, explored and presented. Death Parade, a story about the human condition, morality... and sadly nothing at all. For everything Death Parade could have been, at the end of the day it was simply wasted potential. Now let's make this clear, this show is entertaining. Because we're constantly seeing new people judged due to the semi episodic format, every episode becomes something of a spectacle. In any other show someone going off the rockers might be the climax but with DP it's a constant occurrence. We are constantly left guessing as to who will receive eternal damnation and who would be gifted with rebirth. With the form of judgment being a different game scenario, each episode feels fresh and fun to watch. These often play out in very unique situations as we are slowly given glimpses into the victims' past. This is an area in which it excels since each new person introduced is fleshed out and given believable enough characteristics before each 20 minute run time is up. But because heavy emphasis is placed on the games and judgement the recurring characters are placed on the back burner and this is where our 1st glaring problem arise. I can go on for a lengthy period of time talking about the art, pristine animation , "DAT opening" and unique character designs but it's Madhouse we're dealing with here. It's a no brainer that they brought their A game. It's consistent, sonically well put together and all in all meets every standard on a production level. Instead I'll address the issues. The cast, which consist of the arbitrators and an assistant, remained greatly underdeveloped. Drawing back to the episodic setup, all time is placed on fleshing out the new stand alone individuals and playing out the games than actually used to explore the permanent characters. Of course they try to mend that within the last few episodes but by then it was too late. Any given stand alone character had more characteristics than the people we see from beginning to end, which creates a huge disconnect towards them and the viewer. They feel like puppets and turn out to be just that as we learn more about them. This isn't a bad thing if they were delegated to a minor role but when you have a show that deals with the human condition, having characters that lack dimensions just takes away from the experience and impact. Again they try to explain this away when we discover what the arbiters are but even that is contradicted by the way it is presented. There is very little separating them from your typical 1 note archetypes. Chiyuki, the assistant, is the only character that was handled properly by being fleshed out and given a reason for being. And even then she was just fleshed out to basic standards and leaves no room for a character study since this all happened towards the final episodes. Another inescapable issue was the subpar world building. The only setting that's ever explored is the bar in which the judgement occurs, everything else that we occasionally see remains shrouded in ambiguity. The world mechanics are only talked about on a surface level and it feels very underwhelming because of it. Even after getting a general idea as to how everything works it still feels hollow. It's still entertaining to look at but with nothing that feels plausible outside of the show's own made up techno-babble it becomes frustrating if you take a minute to try to comprehend or even explain it. It was flimsily handled and with so many aspects left unexplained it became pitiful when analyzed. Death Parade isn't a bad show, just one that wasn't properly utilized to its full potential. It had the setup to be something thought provoking and entertaining at the same time but due to the humdrum cast and unexplored setting it only passes as a nice popcorn timepasser. also the opening since no one seem to shut up about it. Despite my qualms I fully recommend it to anyone since its entertaining to the very least. "Welcome to Quindecim", an ominous and deep voice states as the hiss of hydraulics release pressure and allow the cold steel doors to open. Two people step out. "Please, come have a seat here." The people have no memory of why or how they've come to be at the Quindecim. "One, I cannot explain where you are, or how you came to be here. Two, we will now have you play a game. Three, we will have you select a game by roulette. Four, you will stake your lives on this game. Five, until this game is over, you may not leave the bar." The alternative to playing is explained as "not something they want to experience." The tiles light up in sequence, backed by a crest. It flips and reveals what's a seemingly mundane bar game. The participants, totally unaware of their circumstances, begin the most important game of their life: their judgement. Dark, ominous shades permeate the show. A whirl of blacks, purple, reds, and blues set the foreboding tone, and the dynamic of bright lights and shadow interplay beautifully. Madhouse has created a product of passion with Death Parade, and it shows through their impeccable attention to detail and care in creating this show. Character design consistency is strong, key frames are fluid. 3D CGI is used very subtly here, under the excellent disguise of cel-shade- to great effect. It never looked fake, it never stuck out: just smooth. Character's anguish, regret, anger, and hope shine through on their faces. While animated, I really felt like the characters were experiencing real emotions. They ugly cry, they bleed, they contort in unbridled rage, and overall feel really human. Smooth would be the best way to define the art here, everything is neat, crisp and fluid. Swirling lights, darks, and brilliant displays of energy color the typically dark palettes of the show. Much of it takes place in a darkened ballroom, and really allows the lighting and brightness of the conflict to be cast against the darkness and shadows. Despite not being able to speak Japanese, I was able to empathize with the characters through the voice performance. The high quality voice acting was able to convey emotion, tone, and mood clearly, despite the language barrier, and be effective in that. Numerous times I was struck by tears from the pain and suffering, or from the inspiration and hope that were brought out by the voices. The OP is a bit deceiving, as far as the content and tone of the show go. It's a very catchy, upbeat, danceable tune: "Flyers" by BRADIO. The ED is a more melancholy, emotional performance in "Last Theater" by NoisyCell, which is a new favorite of mine. Both are excellent. As far as background music goes; there's a lot of silence in Death Parade, which really allows the vocal performances to be more impactful and emotionally powerful. What BGM there is typically consisted of soft piano music, which played in wonderfully with the more subdued and introspective moments. Upon entrance to the Quindecim, we're treated to the sight of a white haired, steely, dispassionate man known as Decim, purveyor and arbiter of souls. He's described as "all drinks and seriousness" by his boss, a seemingly young woman with cold eyes and demeanor to match, Nona. Decim's purpose is to ensure that the entrants to the establishment agree to, and carry out their contract to play a random game of chance, enforce the rules, and execute the results. Though he seems hard-hearted and unsympathetic, Decim is shown to have a more... humanistic side. His statement, "I have respect for those who have lived fulfilled lives" is very telling of his true heart, and is the principle which guide his judgements. is our first entrant to Quindecim. Utterly devoid of any memory, even that of her own name; Onna is conscripted to be an assistant to Decim, and to facilitate the judgement process. Throughout the course of Death Parade, Onna provides a strong presence of morality and reason to the cold, calculating judgement that typically took place before her arrival. She is an idealist and optimist, wanting to believe that there's redemption to be had in even the darkest of souls. Through her input and occasional intervention, the outcomes of the judgement are not always what they at first appearance should have been. Aside from her role in the assistance of Decim, she follows an arc of her own; one of discovery. As she learns about the process of judgement, she likewise learns what it meant to have truly lived. Like any other guest to the bar, she knows that there must be a time in which she too must be judged. A minor complaint here would be that supporting characters such as Nona, Ginti (who each get an episode a piece to themselves) are underutilized, along with Clavis, Oculus, Quin, and Castra. Death Parade takes a rather unique approach in how it unfolds the story and morality lessons within. It combines the best aspects of episodic, arc-based, and linear storytelling all into one, which sounds weird on paper, but works to great effect onscreen. Each episode typically contains two entrants to the bar, who then play a game designed to be maximally stressful, or to draw on their inner natures of suspicion, deceit, jealousy, anger, hatred, greed. The characters react in a variety of ways: their desire for revenge, enacting their sense of justice, playing off their own regrets, or their longing for redemption. They are then set to be judged based on their actions, as their memories alone (which are compiled and studied by the arbiters prior to the person's arrival to Quindecim) would not suffice. Death Parade is a very character driven story. Given the limited amount of locales (excluding flashbacks and memory recalls) we're given a lot of screentime with the same characters, but it never felt rehashed or rushed. For a one cour show, the pacing is absolutely phenomenal. It would have been an easy setup for a completely episodic show with the one episode characters coming in to be judged, and being sent away at the end. Alternately, it would have been just as easy to use arcs, 2 or 3 episodes a piece for one judgement. Again, Death Parade takes these along with two subplots (with major implications) and assimilates them into one extremely cohesive, subtle story focusing on moral ambiguity and the nature of what it is to be human. Memento mori: "Do not forget that you must surely die someday. As such, that is all the more reason to live now." In this story, memento mori, a Latin phrase meaning "remember that you must die" takes a front seat on the rollercoaster of feeling and emotion that Death Parade evokes. It's been explained that the souls of the dead come to be judged at this mystical bar, however, what happens when a soul is never judged? This question is explored within the show, in two different formats and in two different ways. We slowly find that there's much more to these arbiters throughout the run of the plot, that all is not as it seems in their role as judge of the souls between the void and reincarnation. Subtlety. The first plot point to address is that of Onna, and her quest to discover her identity, and with it, her reason for being at Quindecim. Afterall, only those who die at the same time as another person are 'invited' to come, yet she's alone. Every other episode or so, we're shown a small clip of Onna in her room at the Quindecim, and each time, she discovers a new object that was previously not there. I didn't catch this the first time I watched, but after going back, it was there. Each object that appears has bearing on her life before death, and serves as a mirror to the more episodic plot going on. As she slowly recovers her memories and identity, she must take part in observing and assisting the judgement of those who also recover their memory through triggered points in the games that they play. Towards the end, she receives an episode entirely of her own that brings with it many revelations of her time before, and how she looks to the future. Balance. MADhouse really has a taste for the dramatic in this show, however, it's not all doom and gloom. Just at the point when it starts to feel like Death Parade is getting formulaic, it's turned on its head. Episodes 1 and 2 provide an interesting dynamic in that you're given the same thing to watch, yet from two entirely different perspectives. Death Parade takes themes and brings them to the forefront of each episode and sets them opposite each other, to reflect and deepen the meanings and duality within. Episode 4 and 8-9 are standouts here. In 4, we see a subversion of what it means to love. A celebrity mother with a tragic past who cares nothing for anyone but herself, yet 'loves' her children, and a misunderstood young man who hated himself and resented his new step-mom for selfish reasons that made a tragic mistake. Their positions in the story are two sides of a coin… one parent, one child, both with familial issues, but stemming from very different reasons. In two later episodes, Death Parade takes a darker turn, dealing with murder, malice, and revenge. When two people commit unspeakable crimes in the name of justice and revenge, despite being for noble reasons, does that make them justified? Again, the moral ambiguity- one for protection of loved ones, one for a twisted sense of justice; both killers. I enjoyed every minute of Death Parade. I laughed, I cried, I was angry, I was reviled. Death Parade explores a huge range of emotions, thoughts, moods and feelings. The emotional impact of this show is not to be understated. "Feels" gets tossed around a lot when describing this show, but it goes much deeper than that. Death Parade is a cross section and examination of human nature. On trial for your life, presented with some of the most stressful and painful memories and experiences you've had, is it your actions that define you, or the intent behind them, or some third thing that makes you only human? Whose place is it to decide if what you've done is damning or worthy of life again? I'm loath to give out a perfect score other than categorically, but Death Parade gets so many things right in such a complete package of a show. Emotional depth, empathy, charisma, mystery, intrigue... It's all here. 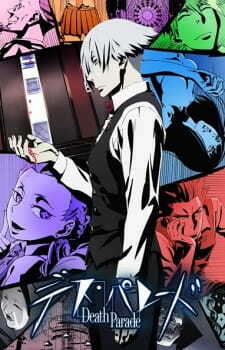 Believable characters, and a sense of connection with the events going on while being spun a rather unique narrative on morality and examination of the human condition, Death Parade is a true gem. Refreshing in many ways, this show is one that should be considered a modern classic. "Judgement must be performed hand in hand with both life and death. it is something that must be performed hand in hand with humans." "Life is something which is always met with unfairness; there are those who live fulfilled lives, and there are lives that pass away in no time at all." Morality is, and always will be, a perpetual grey area; it is akin to something like a no man's land. It's a subject that brings about wonder, bewilderment, and also hostility. Are human beings innately morally good or are human beings naturally inclined to be morally evil? What is considered morally good and what is considered morally evil? What draws the line between the two, and how does this get decided? There is no real, correct answer. As a follow up to the very controversial Death Billiards, Death Parade arrives and elevates these inquiries. As a viewer, you will venture into Quindecim with many questions. Unfortunately, you will likely leave with an unequal amount of answers. Morality acts as the big hook which Death Billiards, and subsequently Death Parade, employs in order to draw in the initial interest of the viewer. However, this is somewhat of a bait-and-switch given that the series doesn't retain the concept of open-ended judgments, like done in Death Billiards. When I watched Death Billiards, and also the first episode of Death Parade, this was one of the biggest attractions that the series had. It felt engrossing and pushed me to ponder substantially more than your average show. Sadly, Death Parade does not choose to continue down this path. Instead, the show opts to offer explanations for things that could have been better if left to the imagination. To me, it felt a bit intellectually insulting to be given a breakdown and explanation of who received reincarnation, who received the void, and why. Story-wise, Death Parade is a very character-driven series that heavily utilizes games and their participants as major plot-devices, almost to a fault. Because of the reliance on these two as plot-devices, Death Parade seems to suffer from the perspective of a solid, linear narrative. The heavy emphasis on the games, and the minor characters who partake in them, leave many aspects about the show, which potentially may have yielded something interesting, only lightly touched upon. Due to the necessity of Decim and Onna needing to grow as characters, more emphasis was put on the games and Decim's resulting gradual enlightenment. Because of this, conflicts and characters on the side are left unexplored. As a result, Death Parade, to some, will seem inconclusive upon completion. Whether or not one finds this to be a good thing, or a complete deal-breaker, is up to the viewer's discretion. While the games themselves aren’t all too imaginative, ranging from throwing darts, bowling, air hockey, an arcade fighter, and even twister, they certainly act as a fascinating, exceptional medium to force conflict. People tend to act differently under competitive, pressured circumstances, and that is an essence portrayed well in this series. In fact, I would say that Death Parade captures the essence and nature of people pretty damn well. People tend to be stupid, egotistical, and selfish far more often than genuinely good. The ratio of the two in this series reflects this. Despite the game shenanigans providing a new, refreshing form of entertainment, I couldn't imagine Death Parade being longer than a single-cour series while still being very successful; the games, people's reactions, and judgments would become a stagnant, tedious routine, losing its compelling nature. Although Death Parade is exceedingly character-driven, many of the recurring characters, who should be important, aren't very important. In my opinion, this is one if the biggest problems that Death Parade has. Why introduce an intriguing set of characters who essentially add nothing to the series except for a vague sense of mystery? One could easily remove characters such as Clavis, Oculus, Quin and not much would change. The same could be said about Nona and Ginti, who desperately could have used more fleshing out. Many of the game participants were far more interesting than the arbiter crew and company, and I'd say that leans more on the negative side than the positive. The only two exceptions to this are Decim and Onna, who are focal points of the series. Although I’ve outlined some of the biggest flaws I found in Death Parade, all things considered, it was still a very enjoyable show. A large part of this is due to the wonderful production values and execution this series has. Madhouse did a fantastic job with this series visually, which certainly did the series justice. Sound-wise, Death Parade knew when to be both proper and ludicrous, adding that little extra 'oomph!' to the show's overall enjoyment. If Flyers, by BRADIO, doesn't put a smile on your face, then I don't know what will. In conclusion, I still can't say that there is a clear, absolute answer to the ambiguous nature of morality. I don't believe the arbiters quite know themselves either. Maybe arbiters and humans are closer than perceived; we're both left without a definitive answer in regards to what is truly good and what is truly evil, and yet still make attempts at self-serving rationalizations. Regardless of this, I am still left contemplating the idea. Perhaps man is naturally good, created in the image of God, the creator of all things, who is wise, just, and benevolent. Perhaps man is naturally evil, influenced by their inner devil, and are inclined to be selfish, jealous, and greedy beings who are full of malice and misconstrued perceptions. Perhaps man is only inclined to deem acts good or evil based upon learned social acceptability. Perhaps I, amongst many others, am not meant to know the answer.